with the various challenges confronting the region and beyond. Armed Services Committee who called on him here at the PM House. Graham (Republican), Elizbeth Warren (Democrat), Sheldon Whitehouse (Democrat) and David Perdue (Republican). enhanced investor interest and confidence in Pakistan. relations with Afghanistan and India. 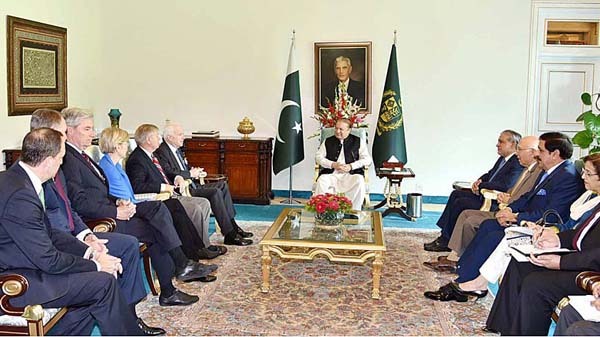 He said that concerted efforts were needed for a politically negotiated settlement under an Afghan-led, Afghan-owned peace process. In this regard, he also stressed the importance of the Quadrilateral Coordination Group (QCG) mechanism to facilitate Afghan reconciliation. violations and brutal repression of unarmed Kashmiris. its relations with Pakistan, which remained a close friend and ally. Pakistan and the successes achieved in the fight against terrorism.